I crept up on this woman in a graveyard to photograph her performing a chicken sacrifice. I intentionally stomped my foot when I shot it to create a blurred image. She heard my stomp, whirled around, saw me, ran inside and came back with a .45 which was meant for me. I quickly ducked behind some mausoleums and we began a Pink Panther-like chase through the graveyard. She got tired and I got saved. 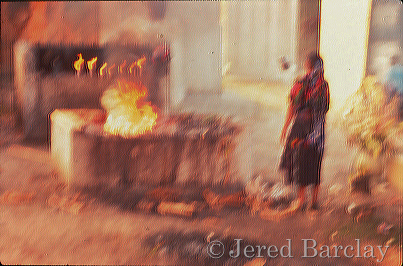 Moral: Don’t stop your foot while photographing a chicken sacrifice in Chichicastenango, Guatemala. 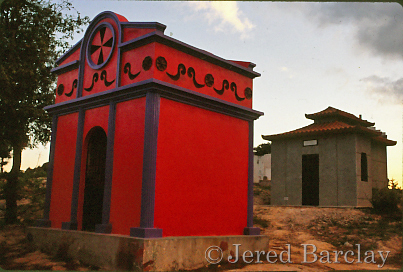 The wealthy are entombed in mausoleums, many very opulent with themes such as: A Roman columned building, a Chinese pagoda etc, and some have formal places to sit while visiting entombed relatives. 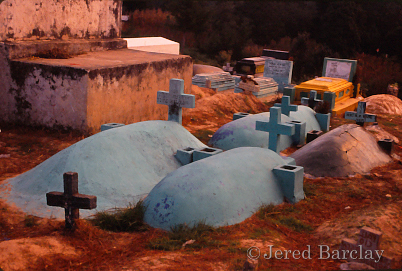 The poor are buried above ground in a mound covered over by cement and painted pastel colors: green, pale blue, pink and yellow. The effect is like seeing a bunch of giant Jordan Almonds thrown at random into a graveyard. Bizarre.